STUNNING BLACK AND WHITE CONTRAST for a difficult year to find in Ultra Cameo! This looks like a later-date Franklin with deep, pitch-black mirrors and smothered devices that glow in the dark with bright-white frost! Mirrors this deep are tough to find on 1951 Franklins period- this example has some of the deepest mirrors for its year. The heavy frost smothering the devices makes you have to look twice at its date! Extremely attractive, deep cameo devices surpass its competition. 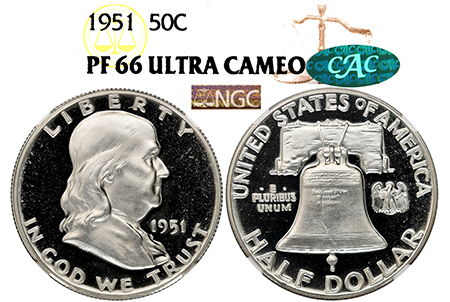 There are just 75 examples graded in all grades Ultra Cameo, with this 1951 being 1 of only 14 examples graded PF 66 Ultra Cameo, not to mention, there are NO examples graded in PF 68 Ultra/Deep Cameo by NGC OR PCGS!